Still interested in winning recipe #5? Of course, Rob needed dessert for his party. I had been eyeing Sarah’s recipe for Raw Brownies and figured a rich chocolate dessert would appeal to the masses. While a cashew-based dreamcake would have been nice, too, I wanted to try something different.. and gasp, something even easier to make. As a make-ahead dessert, this couldn’t have been easier. And the results were great. 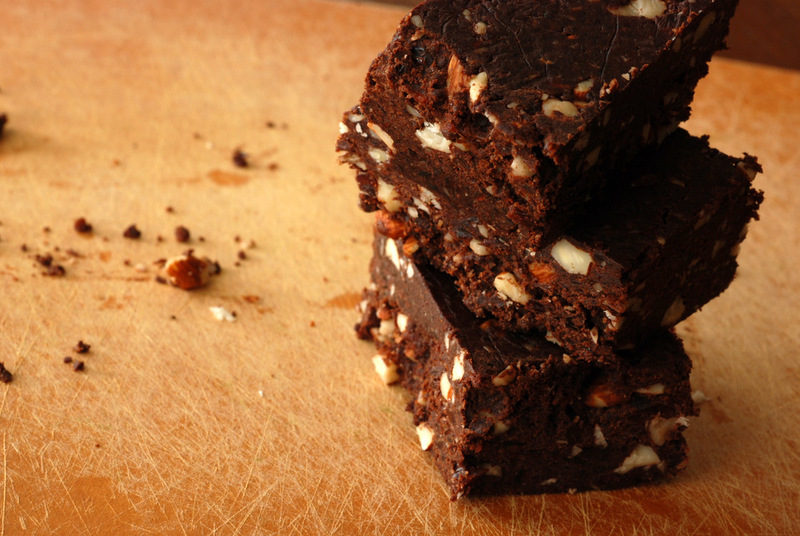 Fudgy raw brownies. 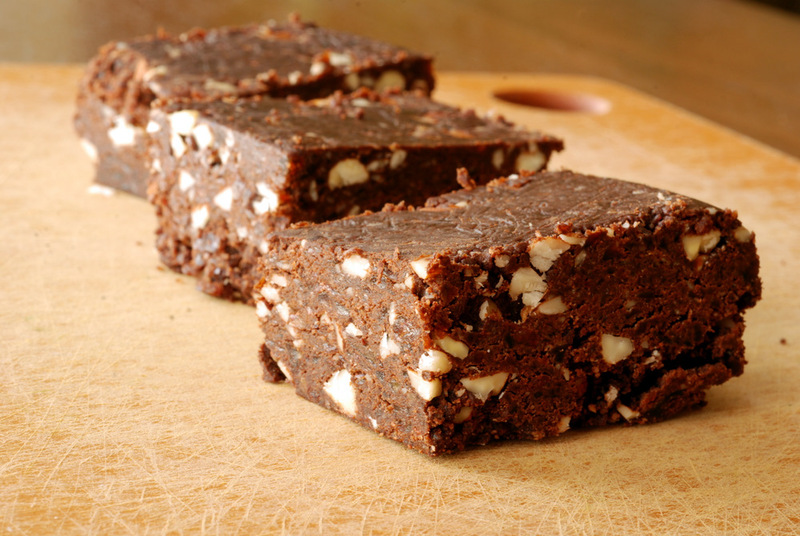 Not too sweet due to the raw cacao powder with great texture from the partially chopped almonds. You can’t really compare them to traditional (baked) brownies, but they are delicious in their own right. I smushed the batter into a 9×9″ tupperware container and while it doesn’t look like a lot of food, these are very rich and filling. When serving, do yourself (and your guests) a favour by making small pieces. This is my submission to this month’s Bookmarked Recipes, to Ricki’s Weekend Wellness and to this month’s Cook.Eat.Delicious-Desserts for Wholesome Desserts. A high of 22°C on Sunday, but only a high of 3°C yesterday. Ouch! 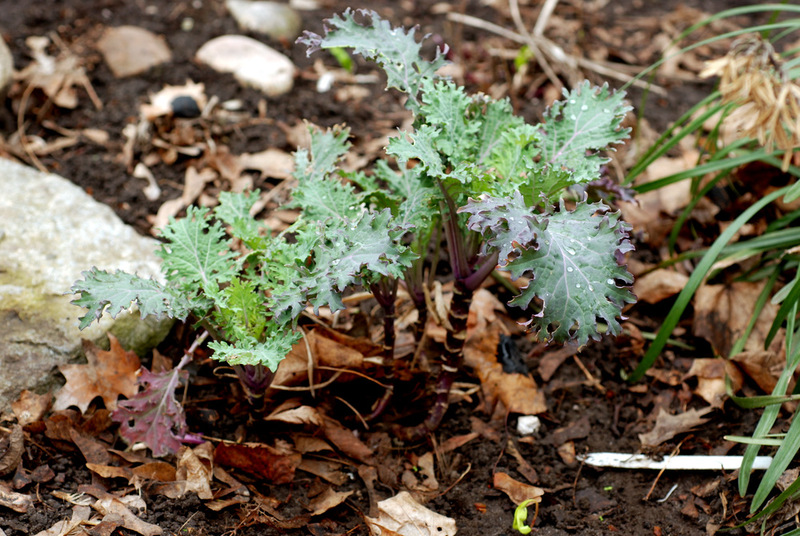 Sadly, the kale will be our legacy gift as we won’t be able to enjoy it this summer (moving! ), although I may be able to eat baby kale salads before we leave. Now, the question for the gardeners out there. What is this plant? Is it a beet? 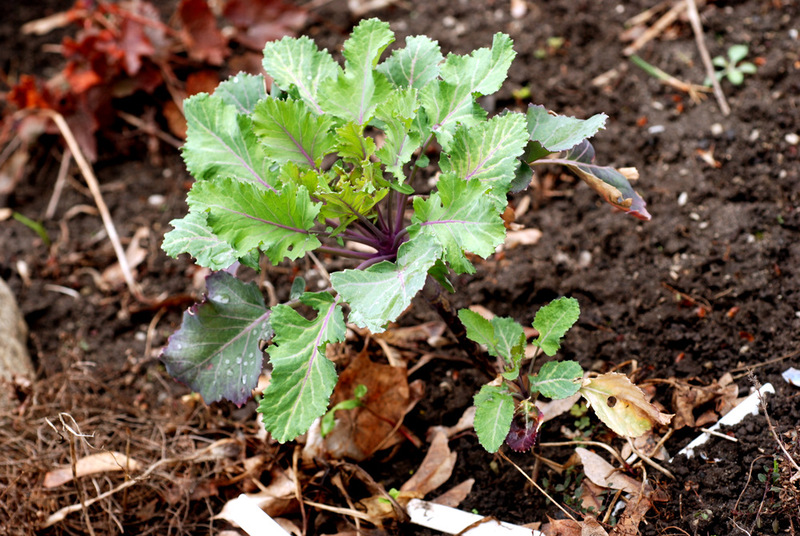 Last year, Rob and I diligently watered a plant all summer, thinking it was kohlrabi. We waited until the plant was nice and big because we thought it was a root vegetable. I eventually pulled it out to see what magical vegetable was hidden underneath….. except there was nothing there. We had been watering a weed!! We were very sad. But this doesn’t look weed-like to my virgin garden eyes (too pretty, no? )… and I don’t want to pull it out yet. We planted heirloom beets and kohlrabi in that area last year but nothing really grew. Our chioggia beets were gourmet: baby beets, not more than an inch in diameter in the fall (hehe). Please let me know if you have any ideas because it doesn’t really look beet-like or kohlrabi-like to me. 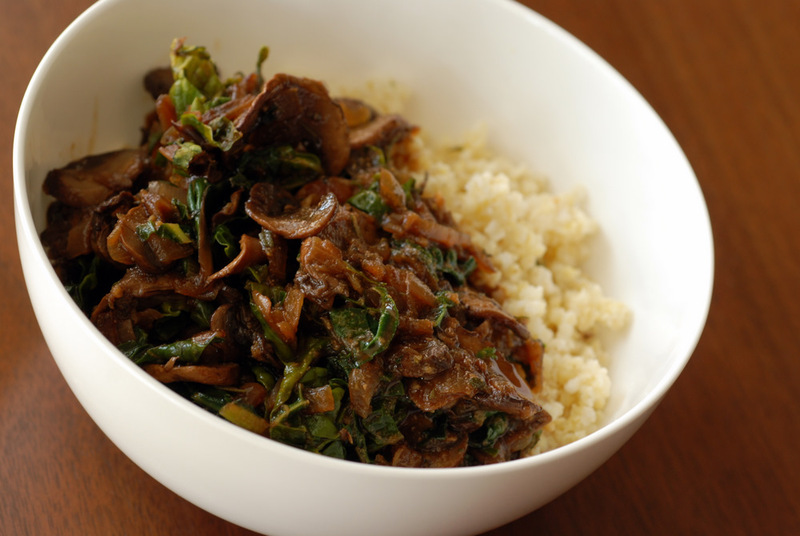 Back to the kitchen: Once I had the energy to cook after returning from Vancouver, the cold weather had me wanting a warming and comforting savoury dish. Angela’s Cozy Millet Bowl certainly hit the spot. 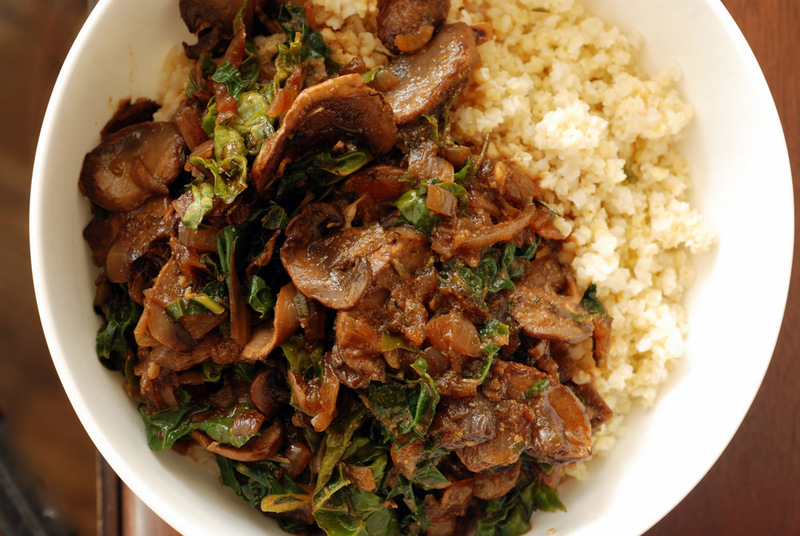 Filled with sauteed rosemary mushrooms and kale overtop millet, this tasted rich without any heaviness. My changes were simmering the millet in broth, omitting the oil (since I was using a nonstick pan), decreasing the rosemary (just because I didn’t want to pick my plant clean), decreasing the tamari (1 tbsp of tamari is salty enough with the broth) and omitting the cornstarch. It wasn’t thick and creamy like a typical gravy but it was rich and savoury without hurting my belly (no grease, please). If you like a thicker sauce, add the cornstarch. I loved the thinness so that it trickled down to coat the millet. 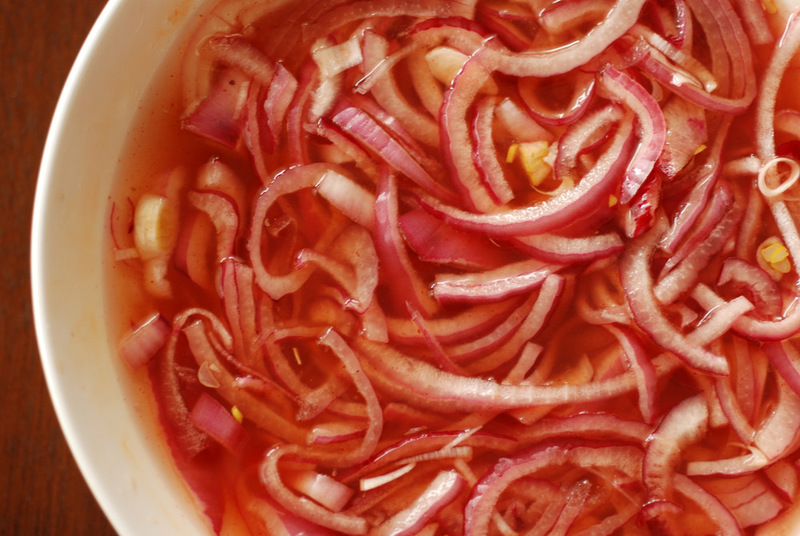 The worst part about this recipe? I wish I had made more! This is my submission to Ricki’s Weekend Wellness and to this week’s Weekend Herb Blogging, hosted by Terry. Oh gosh, am I ever happy to be back at home! Thankfully I was able to enjoy the summer weather this weekend. 22°C, baby! Rob and I took advantage of the glorious weather by taking out our bikes for our first (real) bike ride of the year. I know it has only been 3 months, but I had forgotten how much I love riding my road bike. With the beautiful weather in Toronto, the last thing I wanted was to cook up a storm over the weekend. Rob made a delightful savoury lentil and rice soup that I will be sharing, but it was times like this that I really appreciated having a freezer with the taste of summer. If you thought my fridge was full, you haven’t seen my freezer yet! It is filled with cooked beans, herbs, frozen veggies and fruit, and of course, some meals that I have popped in there for emergencies. Rob and I have a physical menu of possibilities from the freezer: a white board where we keep track of what’s lurking in the cold. 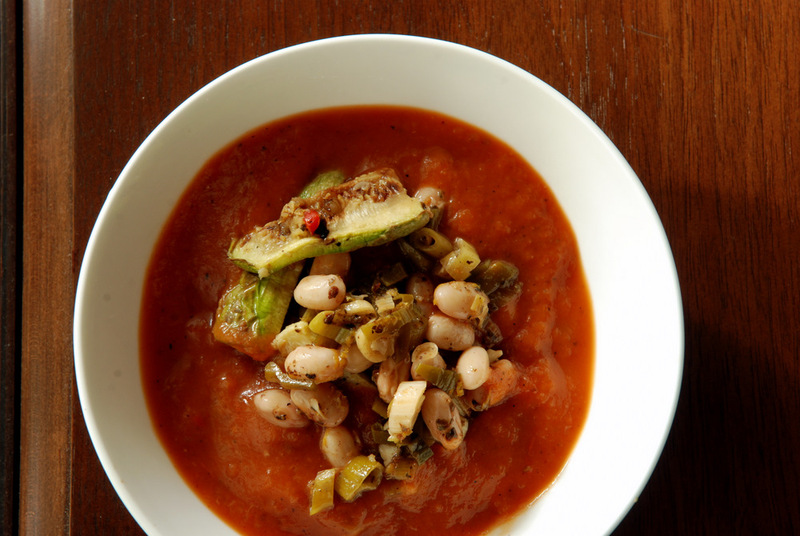 Mainly so that we know what’s in there… so we don’t forget about the container of black eyed peas, half a can of whole tomatoes, or this roasted red pepper and tomato soup with zucchini and cranberry beans. Earlier, way earlier in the summer, I gushed over Denis Cotter. Except I only shared two of his recipes, his not-quite-authentic yet still delicious Massaman curry and the Pan-Fried King Oyster Mushrooms and Bok Choy over a Wasabi Millet Mash. I actually made a few of his recipes this summer, and when I pulled out this soup from the freezer, I was aghast that I hadn’t shared it yet. Shame on me, because it is great. Cotter is the master of the multi-component meal, bringing out the best of each part of the dish. The original recipe can be found in his new cookbook For The Love of Food. Red peppers and tomatoes, right at summer’s peak, were roasted to perfection, then simmered and pureed to create a silky broth. Meanwhile, you cook your cranberry beans (I used fresh ones so this was fast, but dried beans could work, too, after you cook them). You then toss them with lemon juice and marjoram. Next, you saute the zucchini with garlic to take off their raw edge. This can all be done as the veggies are roasting. 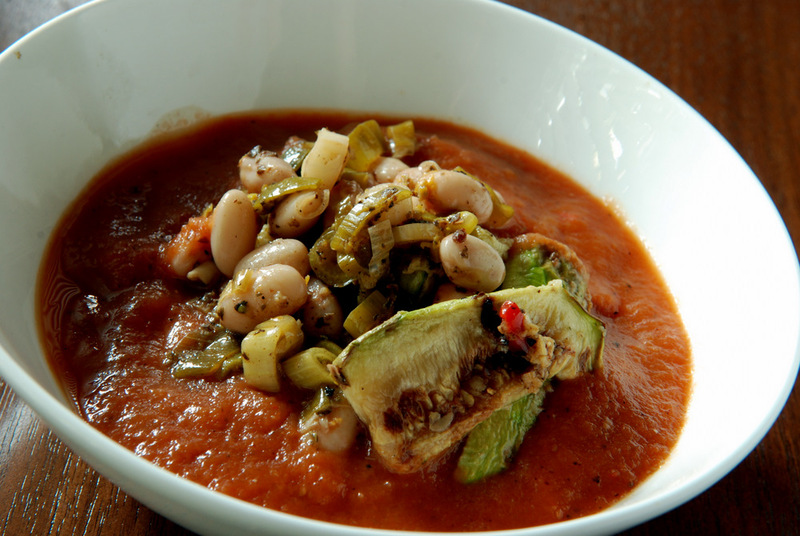 When you are all set to eat, ladle out a portion of the tomato-red pepper broth, top with zucchini and cranberry beans. 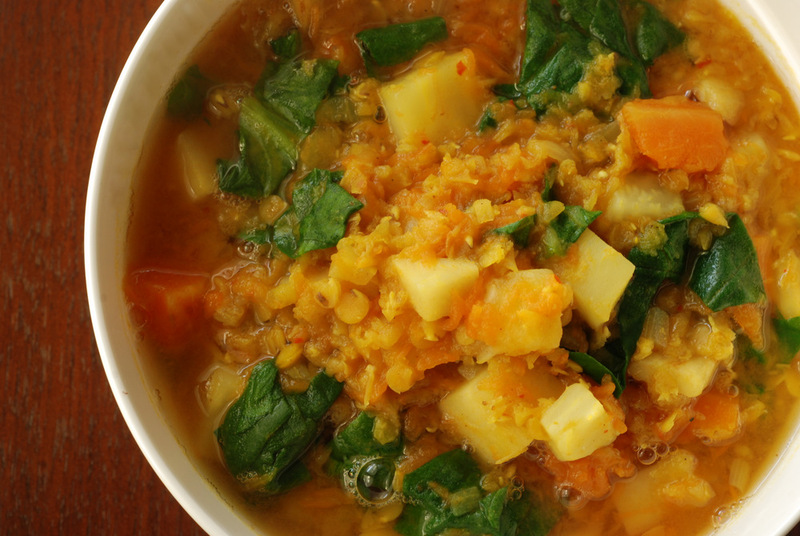 Each component is slightly different, both in taste and texture, creating a complex and tasty soup. 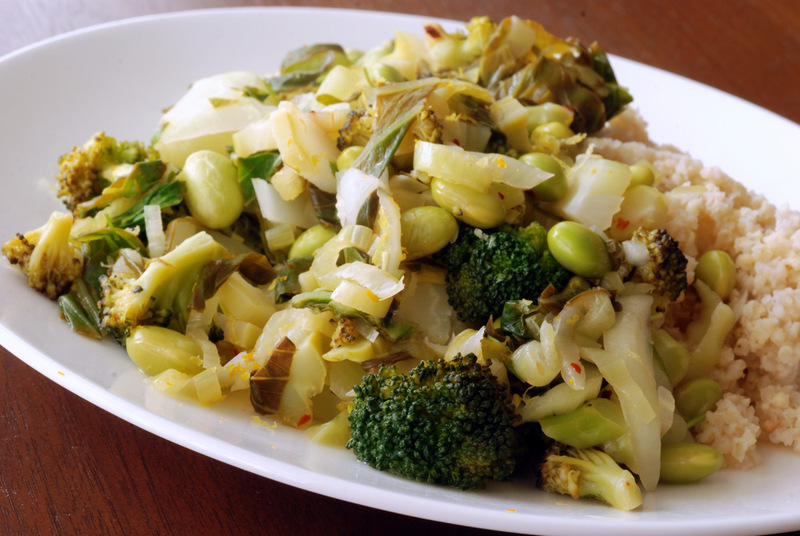 The lemony beans with the garlicky zucchini swim in the creamy and rich broth with wonderful results. Cotter also included a basil-chili oil recipe to drizzle overtop but I honestly thought the soup was great without it. Thankfully, this soup freezes well (I made individual servings and simply combined all the components together) and I still have a few servings left. It is nice to have a taste of summer at the tale end of winter, when flavourful tomatoes are just a faint memory. This is my submission to Deb for this week’s Souper Sundays, to Ricki’s Weekend Wellness and to Cookbook Sundays. Thanks for the feedback on yesterday’s post about changes after embarking on a whole food lifestyle (definitely check out Britt’s post with her experiences). Since I’ve cut out refined flours, I rarely eat bread-type things. I am not sure why but I even have this thing against whole wheat flour. I’d much rather eat whole grains, in their original form, than rely on flours (unless I am making the flour myself in my food processor). But here I am, enjoying pizza without any flours in sight. Be forewarned, this isn’t your typical pizza crust. 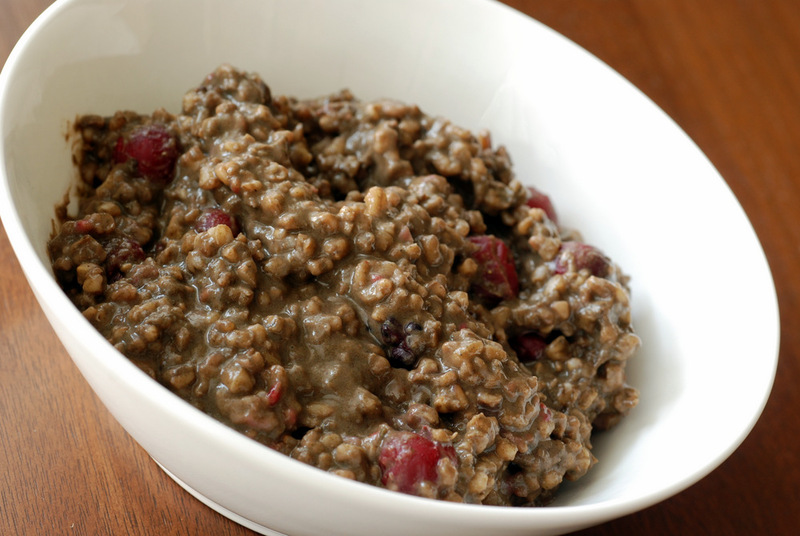 Super flexible with any combination of beans and grains, I spotted this at Everyone is Vegan many moons ago. 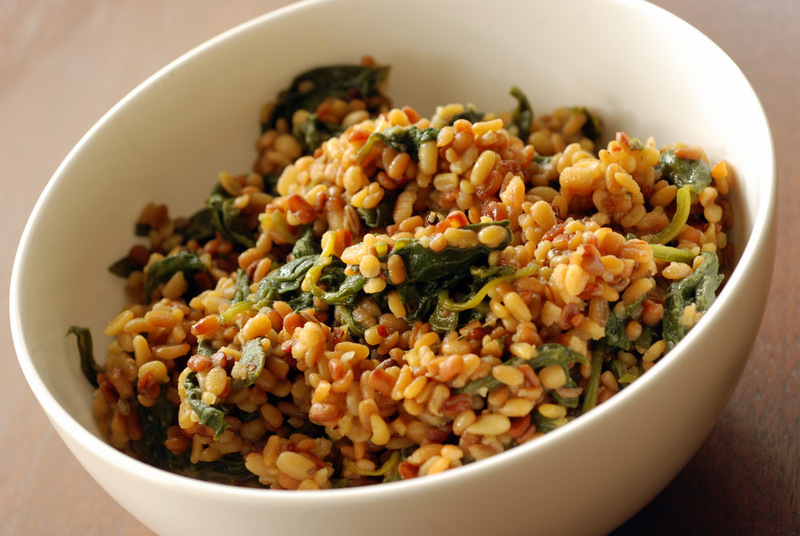 Here, white beans and cooked quinoa are whipped together with flax and spices to create a lovely bread-type crust. 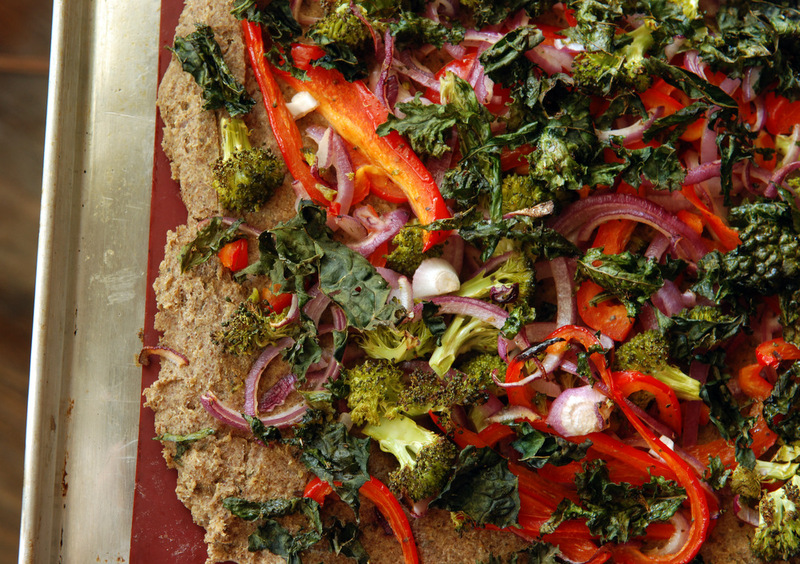 The crust takes longer to bake than your typical pizza crust, which means you get the benefit of glorious roasted veggies. I normally wouldn’t put onion on my pizza, but I will if it is roasted as it is here. Red pepper also roasts well. Broccoli gets that delightful crispy edge. 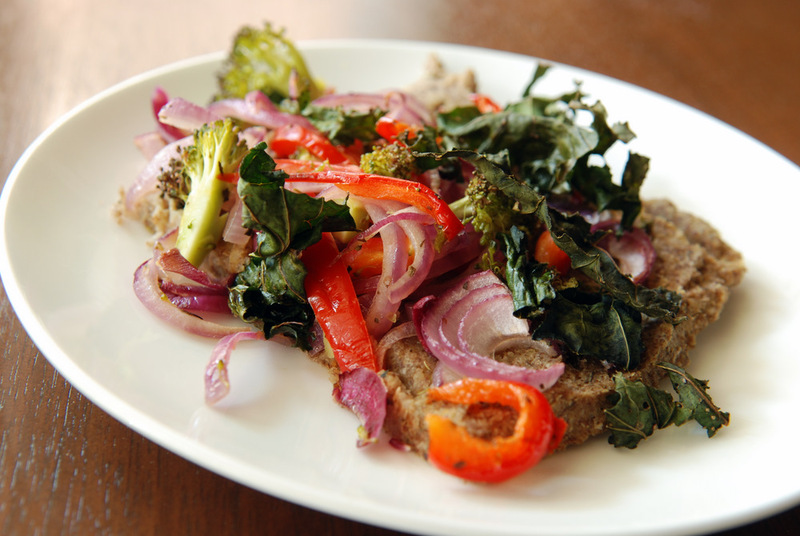 And the best part: laying kale overtop the veggies results in a pizza topped with kale chips! Since I used the miso gravy from the Dragon Bowl, does that make this a Dragon Pizza? Butternut Squash, Caramelized Onion and Mushroom Topping from What Would Cathy Eat? 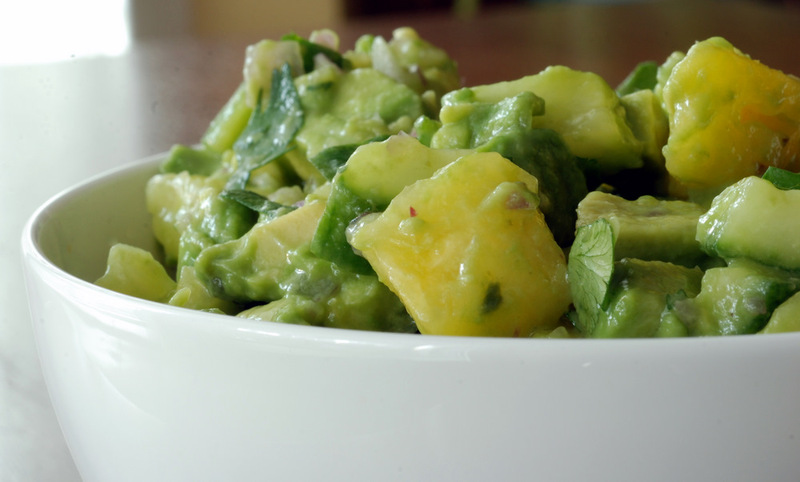 This is my submission to this month’s Bookmarked Recipes, to Ricki’s Wellness Weekend and to Simple and In Season. I am a victim of my own success. Nearly a year ago, I started my whole foods vegan diet, or vegan on steroids as Rob likes to put it. I did it primarily for health and environmental concerns and haven’t looked back. No, really, there is no turning back. I know some people wonder why I can’t just eat something if it has meat broth, or snack on whole wheat bread, or just eat the darn white rice. There is a reason for my choices and I don’t want to compromise. Not all vegan food is healthy. On the rare occasion, I have made small compromises. Last summer, I went to a potluck where a friend didn’t know about my food choices and quickly whipped up some deep-fried tofu-and-lotus root croquettes for me. I should have stuck to my lentil salad, but I also nibbled on a rice dish and the croquettes. I left that night with a belly beyond bloated. At the time, we thought maybe I had mistakenly eaten something with shrimp (of which I do have allergies) because I reacted so badly. I was pretty diligent about picking up some produce to bring me back to my normal routine: tea and grapefruit to start the day. I planned for a simple oatmeal+flax+fruit breakfast, but instead was wooed by Ruth’s Chia Goodness at T&T. Basically it is a souped up chia pudding and I am adamant to recreate it for my next travel destination. 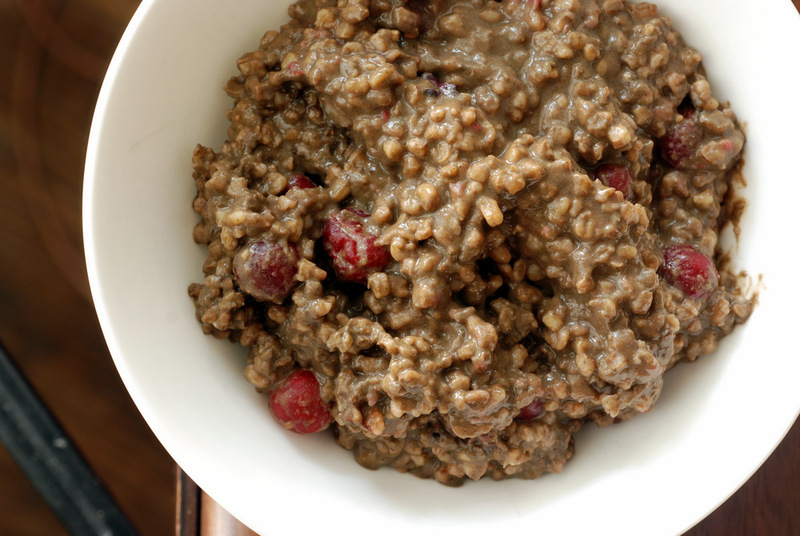 It is easier than my portable overnight oats since I have been using water as the liquid instead of nondairy milk. I picked up a bunch of veggies to make some collard wraps with my hummus (pea shoots, carrots and cucumber), and edamame for my bean salad. However, I left Toronto’s balmy summer weather and was greeted by Vancouver’s cold and wet conditions. In the span of an hour, I can see it pouring torrential rain, followed by some snow/sleet and then the sun will come out and dry it all away. With this chilling weather, by the time a few days rolled around, the last thing I wanted to eat was another cold salad or wrap. 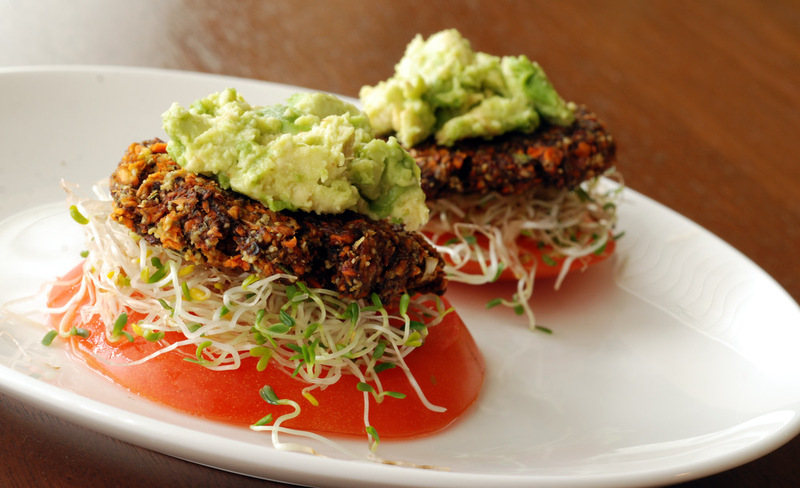 While I had earlier success at some nearby raw restaurants (Gorilla Food‘s Main St Monkey sandwich is so good! 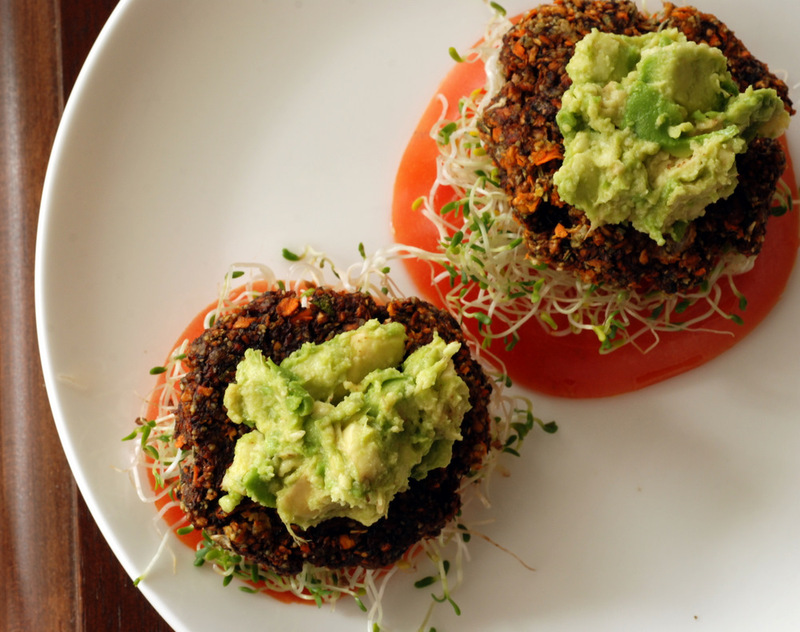 ), I scoped out some hot vegan eats at nearby Nuba, a Lebanese resto with many vegan options. I had enjoyed my meal there last year, so I was eager to have a large glass of carrot-beet-ginger-lime juice, as well as mujaddara. I also opted for a small side of Najib’s special: crispy cauliflower with lemon and sea salt, with a tahini sauce. Unfortunately, a few hours later, I had a bloated belly… However, a few days later, I thought maybe their red lentil soup and falafels could sooth my cold soul. Not so. Within minutes of finishing my plate, my belly was bloated again. I thought I had picked hearty bean dishes, but my plan had been foiled. Even when I don’t know what the offending food is, my belly cannnot be fooled. 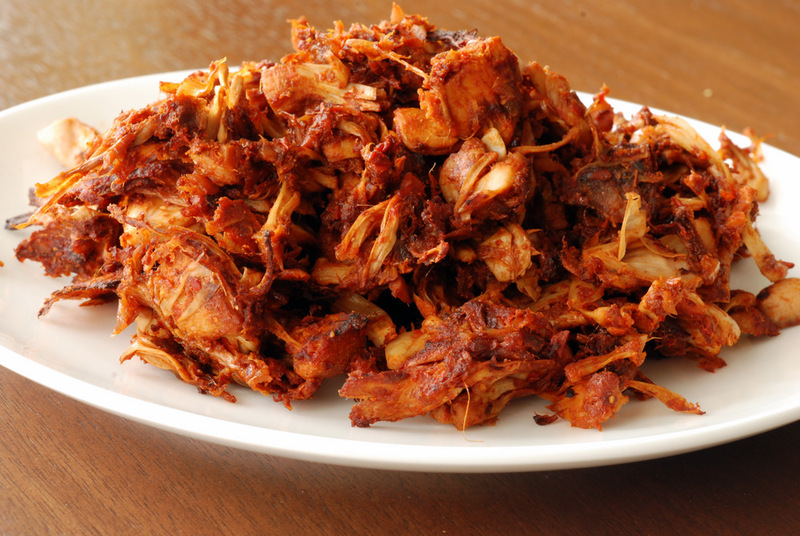 In retrospect, I have blamed it on the deep-frying.The mujaddara had deep-fried crispy onions, that crispy cauliflower – yeah, it was deep-fried, too, and those falafels were also deep-fried. Suffice it to say, I don’t deep-fry anything at home and this was probably what caused my troubles. You see, I cannot go back to my old ways. 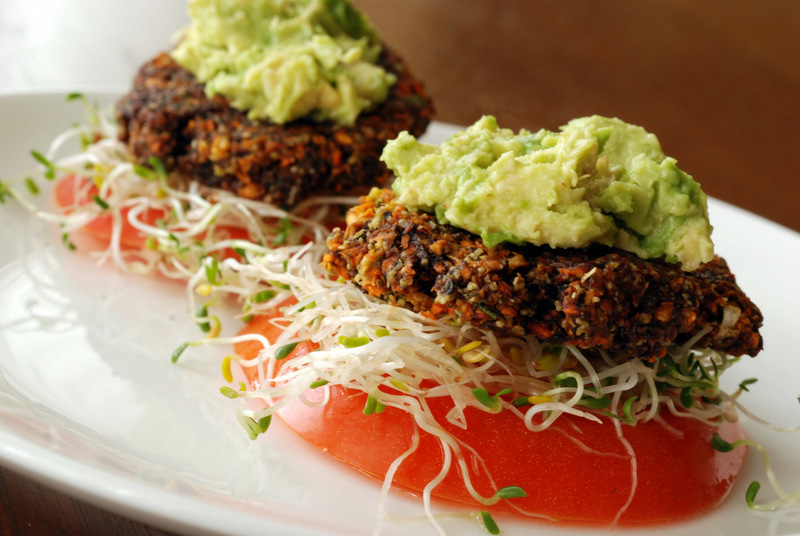 Many bloggers have recently adopted a vegetarian, vegan or whole foods way of eating. I would love to know if you’ve experienced the same since changing. Before I went whole foods, I never really had any digestive issues. Now, a small deviation into junk can easily trigger something nasty. Annie recently said she notices changes immediately when she deviates from her vegan, gluten-free diet. Anyways, back to the hummus. 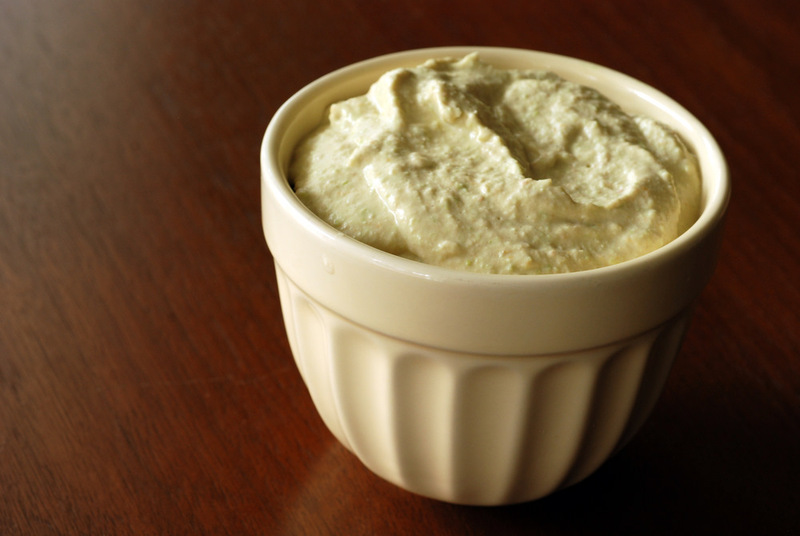 Hummus is the perfect travel food in my opinion, because all you need are some veggies to dip and you are good to go! 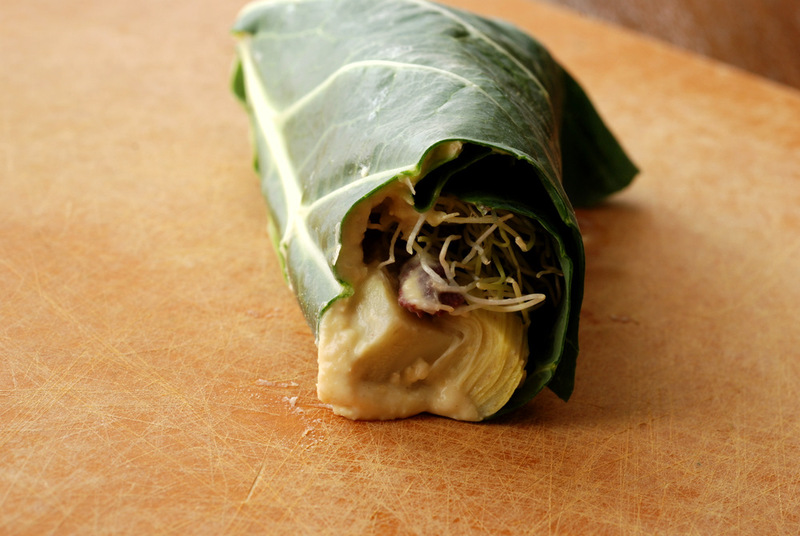 It can also go a bit more fancy with a collard wrap or a hummus dressing for a raw kale salad. While I prefer the traditional recipe, you can easily mix things up with different flavours – any takers for pomegranate red pepper or Indian-spiced? 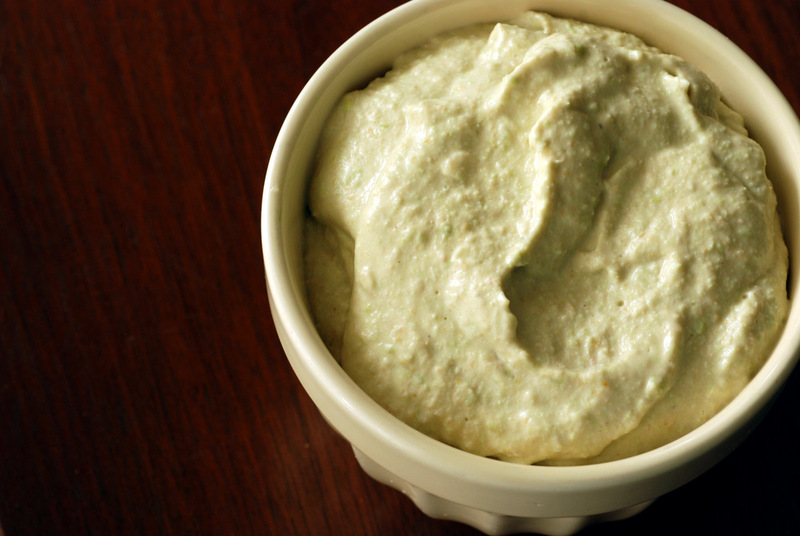 This time, I opted for a spin off of Gena’s Ginger Lime Edamame Hummus which I had immediately bookmarked last summer. 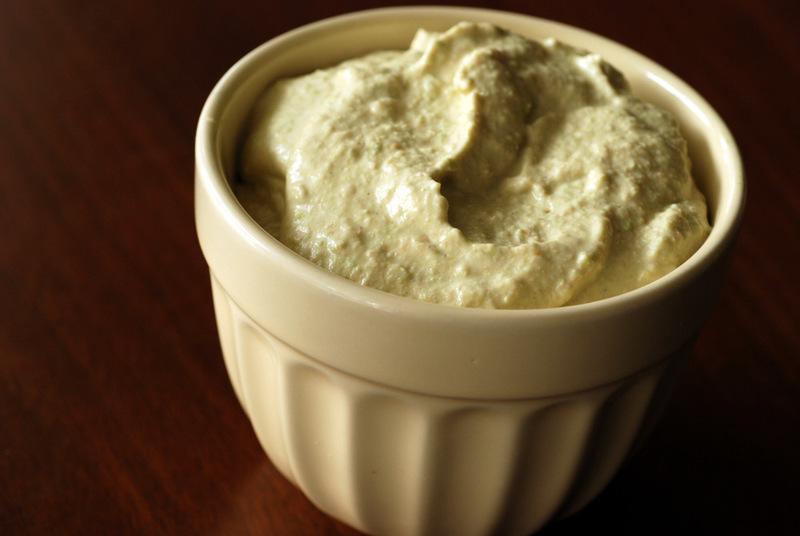 I’ve made some fabulously creamy edamame dips (edamame miso dip and edamame guacamole), so I knew this wouldn’t disappoint. I liked Gena’s suggestion for ginger and lime. Instead of tobasco sauce, though, I added wasabi powder to continue with the Asian theme. 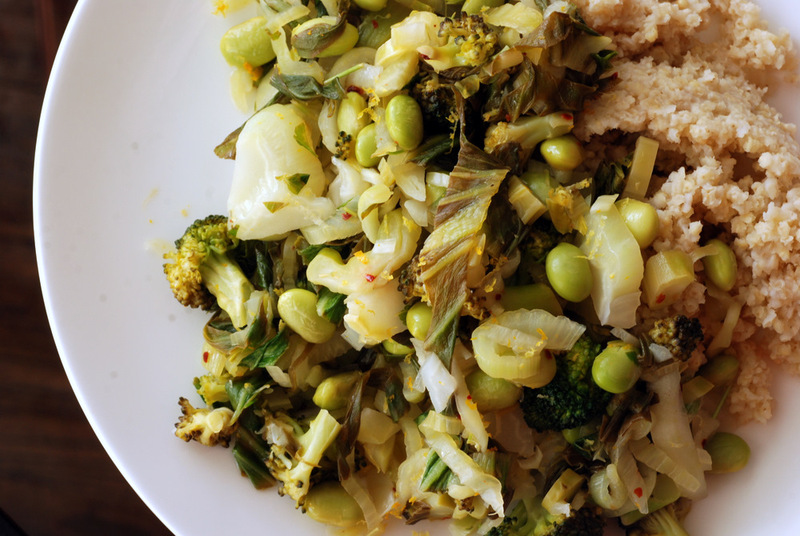 It contrasted nicely with the sharp bite from the ginger and the acidity from the lime, all the while creamy from the edamame and tahini. Yet another successful variation on hummus. I think I will warm it up to counteract my shunning of all cold foods. 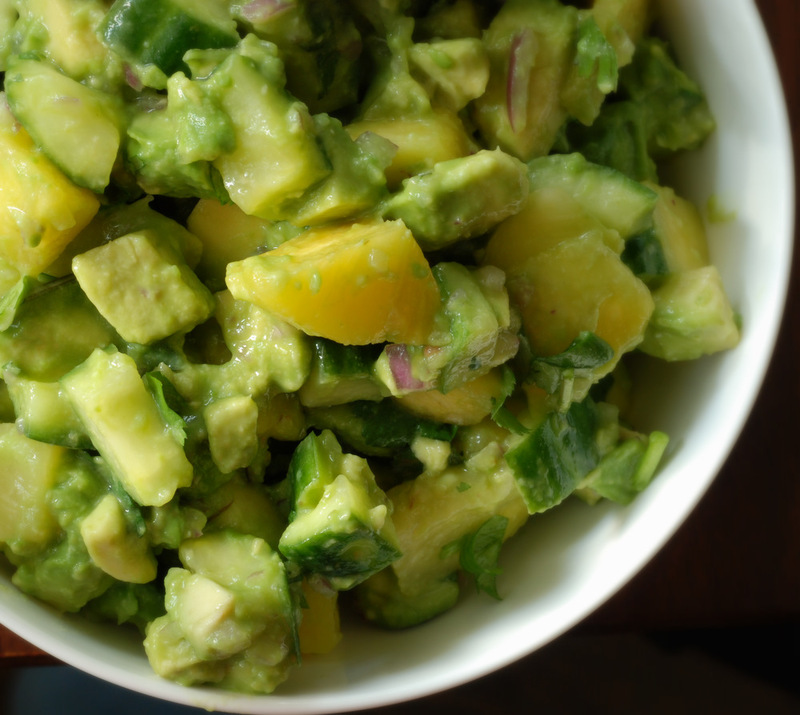 This is my submission to this month’s Bookmarked Recipes, to Ricki’s Wellness Weekend and to this month’s Gimme Green event. In my quest to go simple with my meals, I have been turning to wraps for lunch. I don’t think I have ever had sandwiches for lunch. Even as a child, I remember eating leftover pizza instead. The local pizzeria had a Monday night special: 2 pizzas for $5. As such, my parents bought a couple every. single. week. For years. Pizza for lunch every day. Although I never complained because I loved it. Leftovers, whether a soup, stew or salad, have always been my go-to lunch. 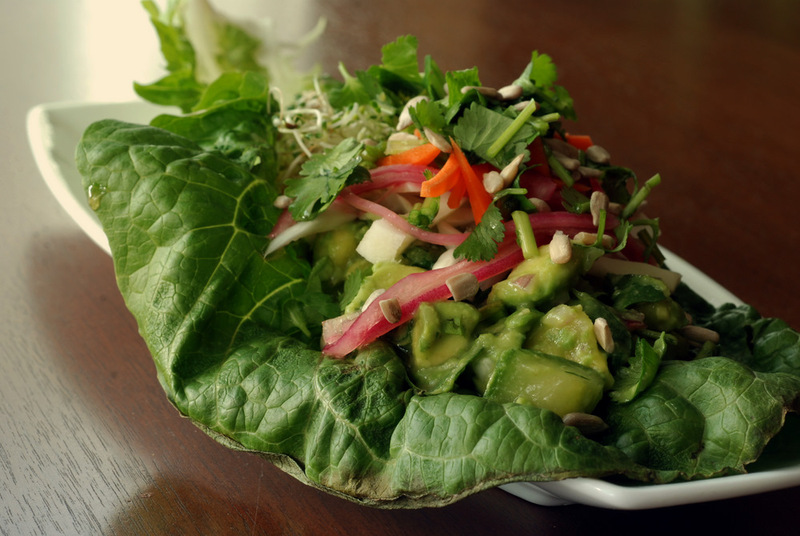 But with my renewed interest in eating more greens, I have fallen for green wraps. Just like you probably don’t need recipes for sandwiches, you probably do not think you need recipes for wraps. 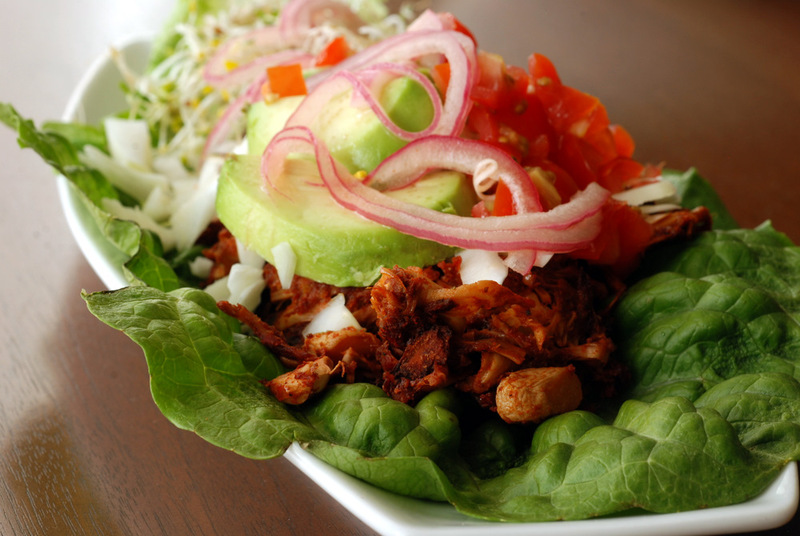 True, my ingredient list is a bit approximate in its amounts, but I love sharing good combinations of wrap fillings. 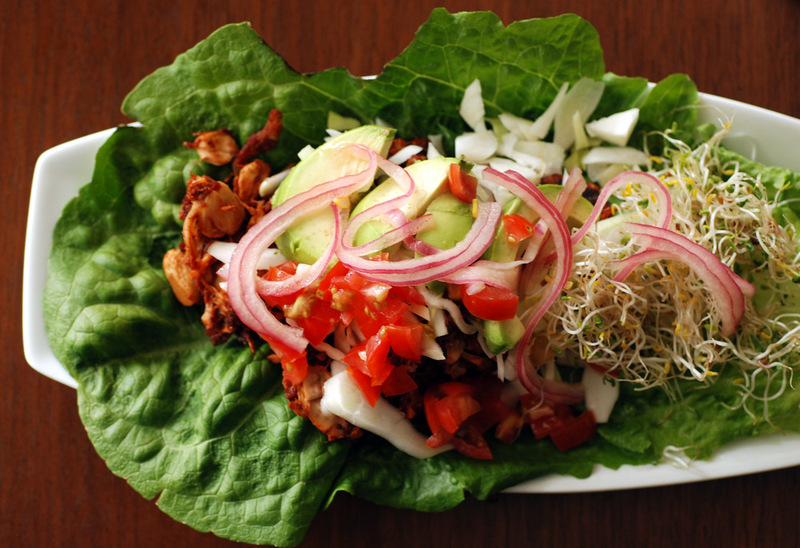 This wrap was inspired by Tess’ Fresh Greek Delight found in Radiant Health, Inner Wealth. 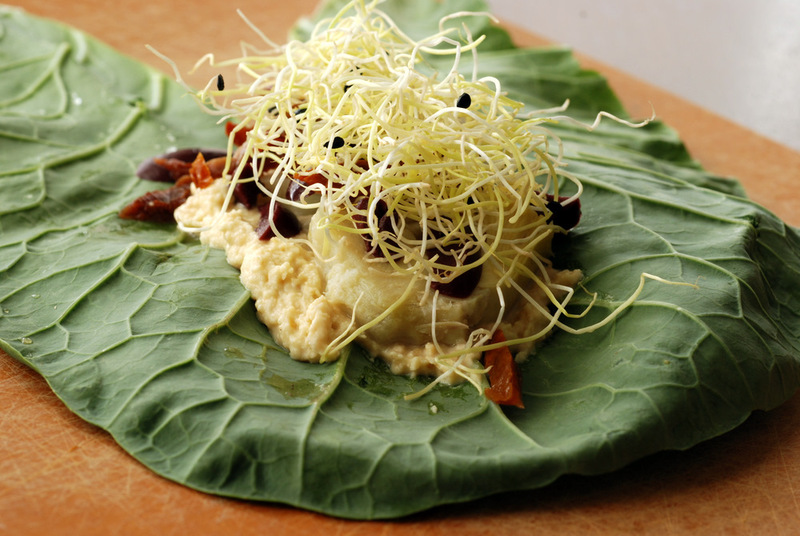 I used a collard leaf to wrap up hummus, sliced artichoke hearts, sun-dried tomatoes, kalamata olives, fresh basil and garlic chive sprouts. The Greek flavours worked well with the creamy hummus, salty olives, bright fresh basil and the zippy garlic sprouts. Enjoy! What are your favourite combinations for wraps? This is being submitted to this week’s Weekend Herb Blogging hosted by Haalo. Celeriac. Pumpkin. Could I be sharing any more autumn-like produce? As I am munching away through my freezer before our next move, I am rediscovering meals that I should have blogged about but for some reason, I haven’t! I am a long-standing proponent of leftovers but oddly enough, when I stash leftovers in the freezer, they kind of sit there for a while. Freshly made meals are always my go-to choice, but I have some real gems being unearthed these days. I have become a bit more accustomed to the tamer curries that are made with curry powder, red lentils and an assortment of veggies. 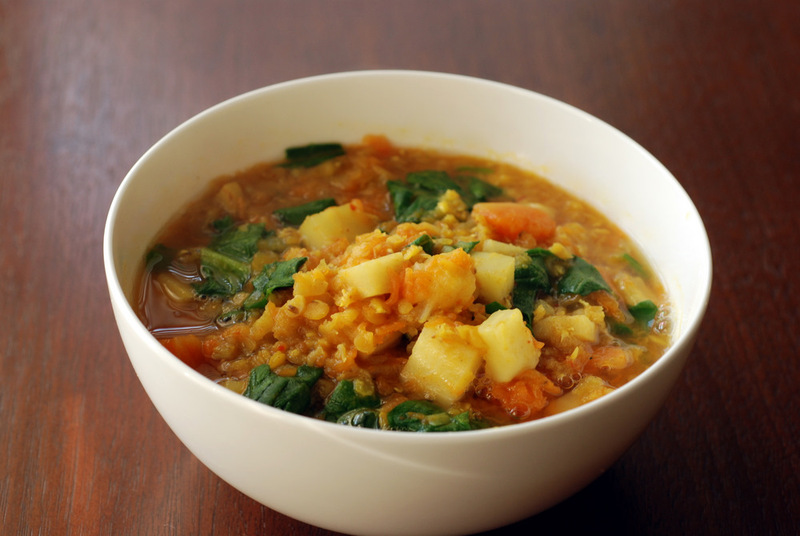 I really liked the Red Lentil and Root Veggie Dal and since celeriac was my favourite veggie this winter, I was eager to try my hand at a similar stewy curry from Sarah. Typically, potatoes are used in Indian cooking but here, celeriac adds a different dimension which complements the sweetness from the pumpkin. I also loved the addition of the spinach thrown in for good green measure. I usually don’t freeze meals that use greens, but these leftovers are ok from the freezer. This is being submitted to Deb for this week’s Souper Sundays and to Ricki’s Wellness Weekend. Guess who biked to work yesterday? With highs of 18C, a nice rain on Monday to get rid of the salt, I was almost feverish in excitement to finally start biking to work! I know it is only a teaser, though… Warmer weather alone does not make spring. Especially if it only lasts a week. There are many ingredients I associate with spring: Baby greens. Arugula. Asparagus. Carrots. And peas. 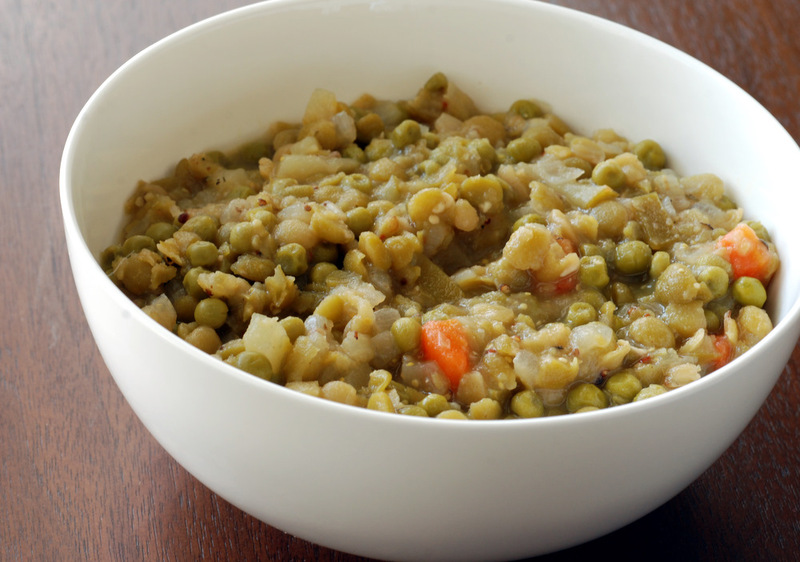 Since the fresh, local produce hasn’t made its way to the forefront just yet, you can approximate springtime with this hybrid of a stew adapted from Love Soup: Finnish Double Pea Soup with Apples (original recipe here). 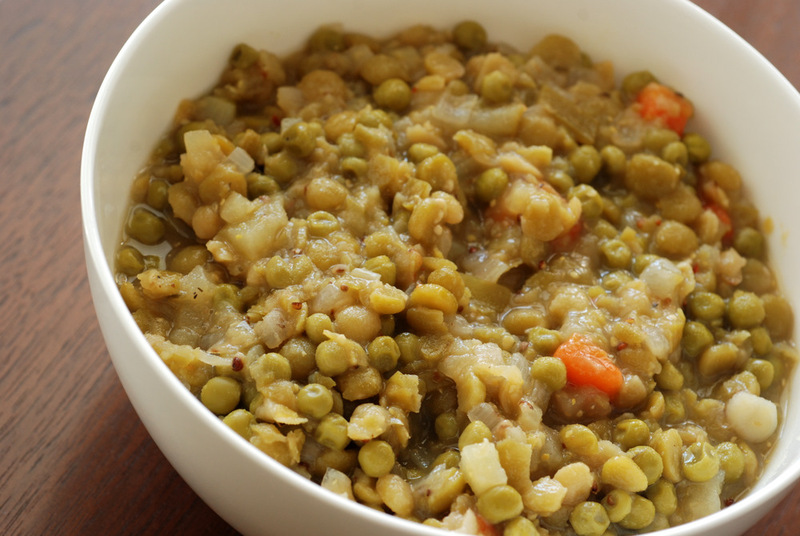 It is a wonderful merriment of a hearty stick-in-your-ribs winter split pea stew combined with a sprinkling of spring with fresh (or in my case, frozen) peas (I used the sweeter petit pois from President’s Choice). Apples also add a hit of sweetness without being too discernible. The vinegar and mustard temper and balance the soup extremely well along with a whiff of nutmeg and coriander. The flavours are not over-the-top but they marry very well. This is my submission to this month’s My Kitchen, My World featuring dishes from Finland, to This Week’s Cravings (Green), to this week’s Wellness Weekend, to this month’s Gimme Green event and to Deb for this week’s Souper Sundays. I have talked about my inherited spice drawer before, but I did not tell you how I am positively smitten by it. It is a bit nonuniform as I haphazardly slotted in new spices in a hodge podge of old bottles, but the easy access to rows and rows of alphabetized spices is positively beguiling in its sheer simplicity. 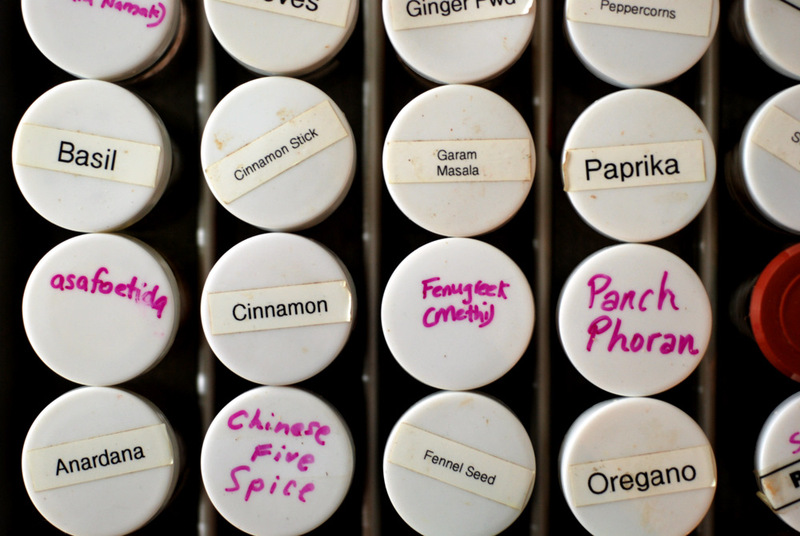 I used to have a rack of test-tubes filled with spices. As you can tell, though, my favourite spices cannot be contained within 12 test tubes. When I move, I need to devise a new spice system. The problem? I don’t know what my next kitchen will look like, or what the next one after that will look like… I need something practical, functional and most importantly: adaptable. The Kitchn has some great ideas but nothing that wows me. This one is really cute, but I want something that is both light-proof, air-tight and portable between kitchens. For now, I am thinking of finding similar white-top glass bottles (from Bulk Barn or Solutions) and storing them in a lightproof box. Do you have a tried-and-true system? Rob has suggested downsizing my cookbook collection before our move to the US. I suggested 20 cookbooks. He thought I could do better. I have over a year to figure things out or negotiate with him. hehehe. Thank goodness he hasn’t capped my spices. I have over 50 spices, for sure. Cooking relies on fresh herbs and spices and it is much easier to move a box of spices instead of plants. I am constantly amazed how a simple change in spices can lead to a completely different meal. In this case, I was curious about using 2 seemingly polar spices together in a savoury dal: cloves and fennel. Who knew that they would work so well together? 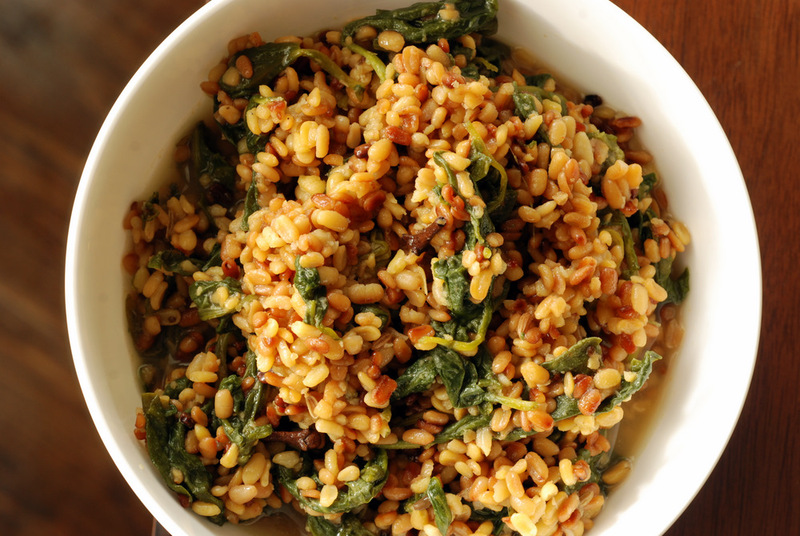 This Toasted Moong Dal with Spinach is a Bengali curry adapted from 660 Curries. Not only is the strong fennel and cloves special to Bengali cuisine, but the lentils (moong dal) are toasted which firms them up. They do not disintegrate like red lentils. Rather, the toasting enhances their nuttiness allows them to keep their shape. This is known as a bhaja. Feel free to substitute your favourite green for the spinach. 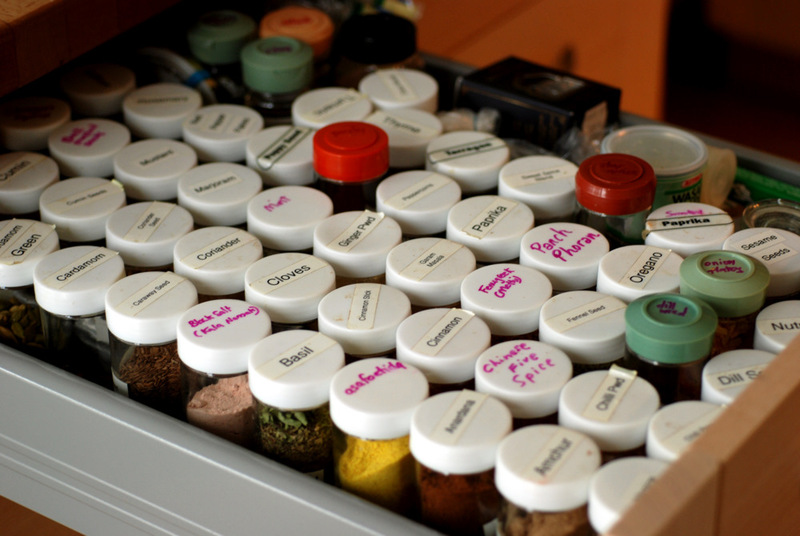 Back to the spice issue at hand – what is your favourite way of storing your spices? This is being submitted to this week’s Weekend Herb Blogging, hosted by Ancutza, to this week’s Wellness Weekend and to This Week’s Cravings (Green).